The Society has a proud history of distinguished members whose works can be seen in major national art institutions, whilst other members' works can be found in practically every regional art gallery in the country, including Nottingham Castle. 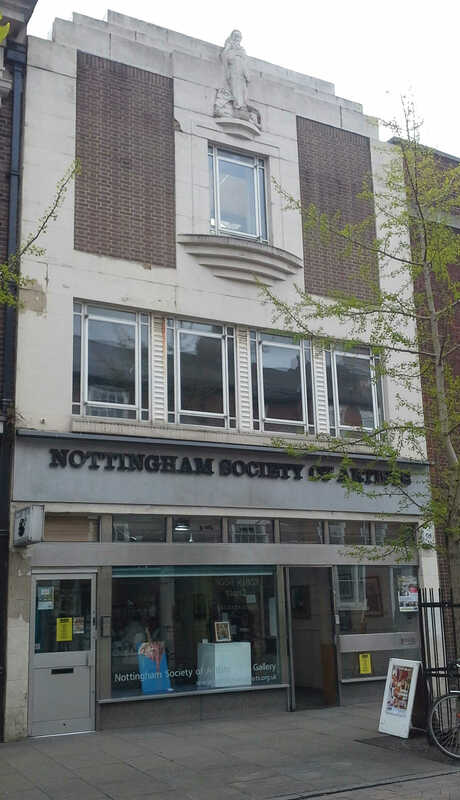 The home of the Nottingham Society of Artists is St Luke's House, pictured left, a three storey Art Deco building in Friar Lane, close to the picturesque setting of Nottingham Castle in the centre of Nottingham. St Luke's House was built for the Society in 1934. It has 4 floors including a basement, gallery, education studio, and members studio. Our studio groups practice Life, Clothed Model, Portrait and Still Life drawing and painting and meet six days and three evenings a week. This is a book, first published in 1980 and updated in 2010, which celebrates the 130th anniversary of the Nottingham Society of Artists which was founded in 1880. Not many art societies last as long as this, indeed not many voluntary societies live to this age, and it is to the credit of past members, (as well as present members), that the NSA has survived so long. It has a proud history of distinguished members including Dame Laura Knight, her husband Harold Knight, Sir John Arnesby Brown, Arthur Spooner, Edward Seago, the poster artist Edward Loxton Knight and the Nottingham sculptor Joseph Else. Some of these artists works can be seen in major national institutions such as Tate Britain, the Royal Academy, and the National Portrait Gallery, whilst other examples can be found in practically every regional art gallery in the country including most importantly Nottingham Castle, City Museums and Galleries. The arguments, anecdotes and events described in this book show a Society with members who held very different views, and were not afraid to present them. The lively social activities which bound them together show the effects of the changing times. Soirees and Smoking Concerts are not popular today. But other activities still keep our members working together, enjoying their artistic endeavours with people who, like them, are keen to improve their abilities and achieve their targets. The Society benefits from each purchase.